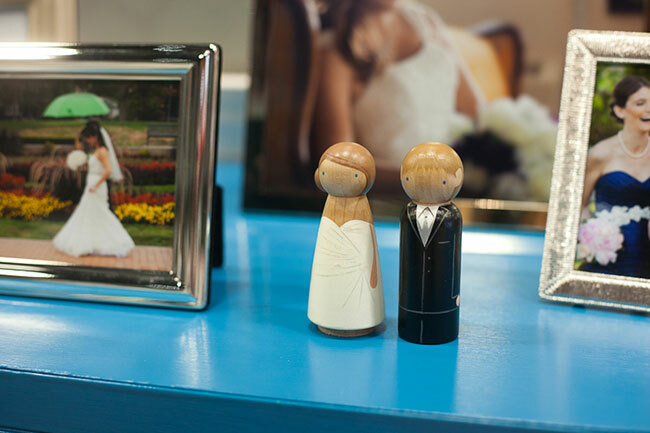 If your market is anything like mine, bridal shows are plenty but often hard to get into. There are the big shows who pull in big numbers but don’t start advertising until a month out. Then there are the small shows, usually put on by venues, but often only allow one photographer to participate. In short, this is something you need to be thinking about ahead of time. I recommend you sign up for any larger show at least 3 months out, because organizers often give the best booths to the first vendors. As for smaller venue-run shows, when you see one happen, contact the venue immediately afterwards and set up a time to meet and chat. Once you feel comfortable with your relationship, ask them how you can be a part of their next bridal show. Entry fees for shows can range anywhere from $300 to over $1500 depending on your market. Head into the show with clear goals about what you’d like to get from it (like “I want to book 2 weddings and exchange business cards with 5 vendors”), so you know whether the show was worth the investment in the long run. I’ve seen vendor booths that range from using the provided table and chair and nothing else, all the way to elaborate sets with multiple walls and expensive furniture. To be perfectly honest, most photographers are closer to the latter. The heavy saturation of our industry has led to an over-saturation of photographers at events like these. Every studio feels the need to stand out (and rightfully so), thus the booths continue to grow in size and expense. Whether you choose to play that game or not is up to you. 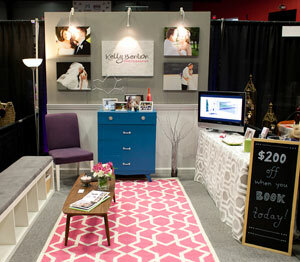 Either way, a bridal show booth can be accomplished no matter your budget. Despite being on a tight budget, don’t give in to the lure of the provided table and chairs. 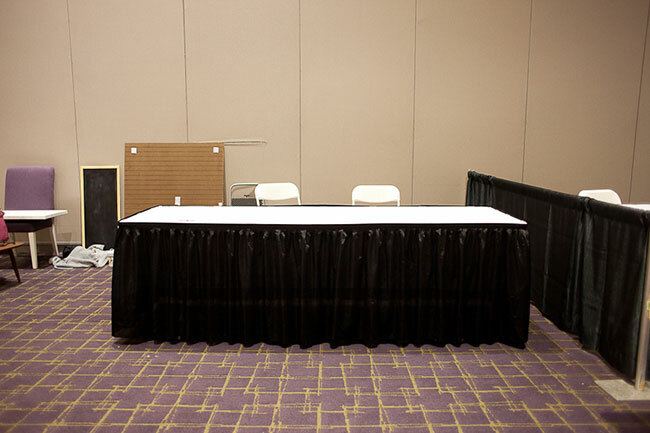 Sitting behind a table in your booth is literally creating a barrier for potential clients. Graciously thank the venue for providing you with the items, then fold them up and move them elsewhere. At a bare minimum, have some prints or canvases printed to hang on your wall or display on easels. You could easily get some sign hooks like these to hang large canvases from a typical pipe and drape setup. Print your logo large on one of the canvases so people can quickly identify who you are and what you do. Bring album samples if you have them (a good use for that free table), and lots of business cards. Stay standing the entire show, and make sure you smile! If money’s less of an issue, there are tons of creative ways to make your booth stand out, all while promoting your brand. Pinterest is a sea of inspiration (check out my Bridal Show board here!). One of the best ways to class up your booth is to construct a free-standing wall. While it’s not an easy task, and it’ll double your setup and tear-down time, if you have a super awesome husband like mine (or better yet… an assistant! ), it shouldn’t be too bad. Before you go shopping for things to fill your booth, take a look around your house. You’ll be surprised at all the things you already own which would make a wonderful addition to your setup (picture frames, furniture, vases, miscellaneous decor). 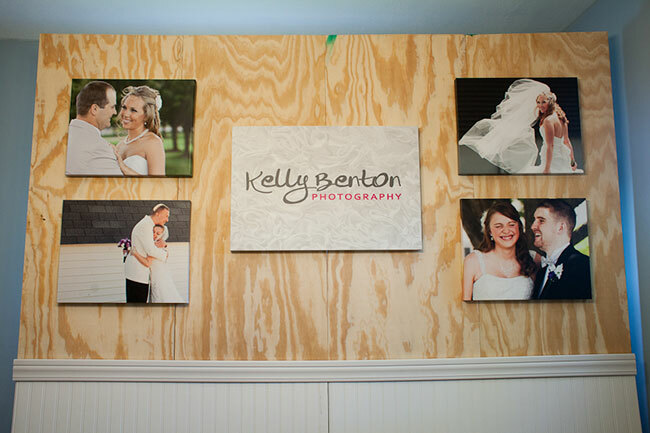 I was fortunate that I was decorating my new office at the same time as my bridal show booth. I bought pieces of furniture that I knew could be used for both. I can’t stress enough how great it is to have someplace for your brides to sit. My first goal when chatting with a potential client was to get them to sit down. If I got them seated, I knew I had their full attention, and they’d hang around for a while. It suddenly felt more relaxed, private, and like a real consultation. I was able to show them album samples, tell them all about my business, and answer any questions they came up with. Some photographers swear by holding a contest of some sort. The most common thing to give away seems to be a free engagement session. The problem I see with this is a) there’s no guarantee that when you conduct the winner’s session, they won’t already have a wedding photographer, and b) it’s an annoying ploy to collect contact info, when all you really have to do is ask. Yes, really… but I’ll touch on that more later. But you have to give the bride something, right? Well, there’s a lot of debate out there among bridal show vendors as to whether or not passing out flyers and business cards is smart, or if it just ends up being tossed at the end of the night. My theory is, it can’t hurt. And if I’m going to give them stuff, then the more times my logo can show up in their bag when they eventually rifle through it, the better. 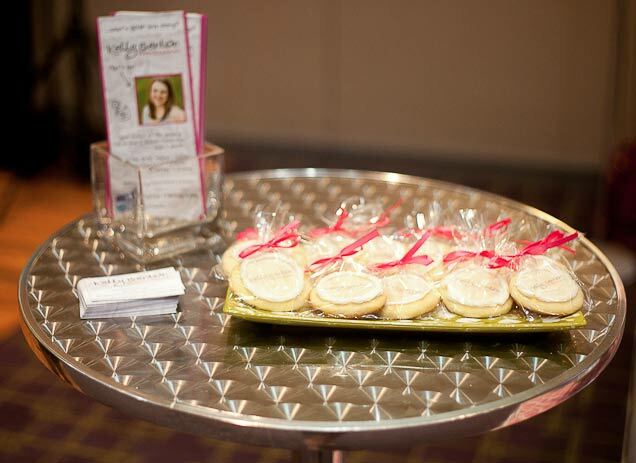 I’m typically giving every bride that doesn’t already have a photographer a rack card, a business card, and a cookie with my logo on it. Everyone loves cookies, right? If we get the chance to chat, and they ask about pricing, I’ll also send them home with a price sheet to look over (but this is only after I’ve told them all about what sets me apart and the value I bring). My rack card has my photo on it (the same photo that’s on my website, Facebook page, Twitter, and more) so they’ll be more likely to remember me. To be honest, it took me 2 entire bridal shows to finally get the hang of this. My first show, I was a nervous sweaty wreck, just spewing random information and hoping something stuck. The second show, I had a better idea of what I wanted to talk about, but kept getting off track and forgetting my most important talking points. I knew I had to do something. Before the third show, my husband and I sat down and created a conversation map. I laid out all the important points, put them in an order that flowed naturally, and left plenty of opportunities for the bride to talk and tell me about herself. I recited my conversation map over and over for the entire 45 minute drive to the show. It ended up going wonderfully. Every time a bride left my booth, I felt confident I had given it my all. Figuring this out was crucial, not only for my bridal shows, but for all consultations and email correspondence down the road. 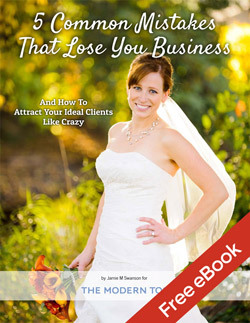 Most bridal shows will provide you with a leads list afterwards so you can contact potential clients. The problem with this is they’re not always speedy when it comes to sending it out, and I like to follow up with people that night or the following day while I’m still fresh in their mind. I used my iPad to collect contact information from every bride I had a conversation with. Not a single person said no. The most important info to me was the Bride’s name, wedding date, email address, and location. I always tried to jot down other notes too, like if they asked about engagement photos, or they told me about their dog. Anything I can bring up again to connect with them on a more personal level. Each bride on my contact list received an email from me right after the show. A few days later, I create an email blast to send out to all the other brides who attended. It’s great to get this ready ahead of time so when the leads list finally arrives, you can just drop in the email addresses and send it off (hopefully being the first vendor to reach them!). Important tip! Use a service like MailChimp to email your leads. Not only is it free, but it lets you track exactly who opens your email and who doesn’t and keeps your emails in line with the CAN-SPAM act so that you’re not breaking the law with how you’re sending out commercial emails. So was it worth it or was it a waste of time? Let’s look at my numbers. So was it worth it? You might think I’m crazy, but it’s honestly hard to say. True, I didn’t book a single wedding from the shows (I’ve long since moved past the frustration of that), but looking back now, I’m pretty sure I know why. Now, this isn’t meant to turn into a debate over how you should price your services, or whether there’s such a thing as “too expensive” for any given market. What I’m saying is that I was too expensive for the type of bride who typically attends bridal shows in my area. When comparing my wedding collections to those of the other photographers in attendance, it wasn’t unusual for me to be the most expensive photographer there. And most of the people who are attending these shows are looking for a deal. A deal I just wasn’t willing to give them. Does this mean that bridal shows won’t work for you? It depends. If the bridal show you are participating in brings in your ideal client and you’re good at standing out from the crowd, then it may work very well. But if your ideal clients aren’t at the show, you can’t book them. That’s what happened here. But it’s not all bad news. Participating in those three shows helped with brand awareness. I’m not just another no-name photographer anymore. And just because someone didn’t want to spend what I was charging, didn’t mean they didn’t love my work, and might recommend me to someone else down the line. 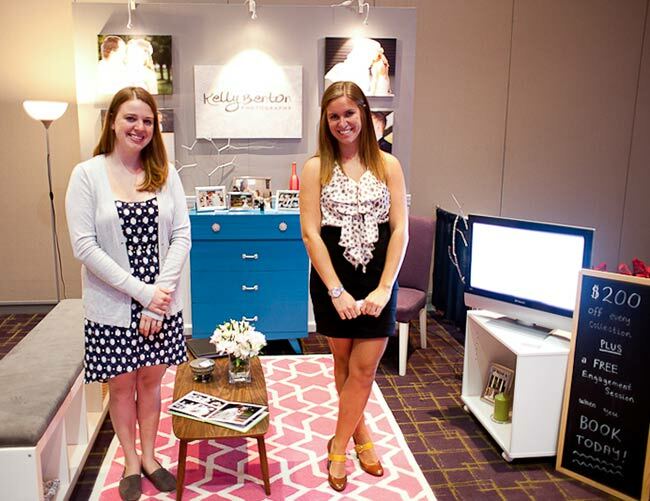 On top of that, bridal shows are great networking opportunities. I met a ton of new vendors I didn’t know previously, some of which have turned into valuable partnerships. For instance, a coordinator who came over and introduced herself at the show, later became the first person I called when I needed help planning a styled shoot. A couple weeks later, she referred a client to me, who booked me for their August wedding. So I did book a wedding because of the show, but not in the traditional sense. Lastly (and this may sound juvenile), but participating in those shows really boosted my confidence. It’s great hearing bride after bride gush over your photography and albums. It’s reassuring when they agree with what you’re saying and how you run your business. There’s nothing like warm fuzzies on a Sunday afternoon. The brides who likes to do her research. She likes to make lists and spreadsheets, detailing what she likes about each vendor and how much they cost. Meeting you for 5 minutes at a bridal show isn’t likely to sway her opinion. The brides who’s working with a coordinator. Part of the coordinator’s job is to help the bride find the perfect vendors. She trusts her coordinator’s opinion, and doesn’t really want to make that decision anyway. The bride who is easily overwhelmed. Dozens of vendors, all coming at her, handing her things, and giving their pitch… it’s just too much. She would rather take a friend’s recommendation and be done with it. The type of show you attend might also be at fault. I found that I received far less qualified leads from a show who had free printable tickets on their website, compared to a show that cost $12 per person to attend. When they’re shelling out cash to go to the show, you know they’re making a commitment to do some serious vendor shopping. What are you thoughts on bridal shows? Good idea or waste of money? Let’s discuss in the comments below.